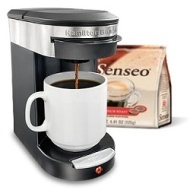 alaTest has collected and analyzed 17 reviews of Hamilton Beach Personal Cup One Cup Pod Brewer. The average rating for this product is 4.6/5, compared to an average rating of 4.4/5 for other products in the same category for all reviews. Comments about the design and size are overall positive. The price and usability are also mentioned favorably, but there are some negative comments about the reliability. We analyzed user and expert ratings, product age and more factors. Compared to other products in the same category the Hamilton Beach Personal Cup One Cup Pod Brewer is awarded an overall alaScore™ of 84/100 = Very good quality. It is a gift for my daughter who likes to drink flavored coffee now and then so it is perfect size as she does not have a lot of kitchen space an can have it at her desk at work. Everything about it is great Have been looking for one of these forever. Thanks so much. I tell everyone who is a coffee nut like me where to find it. Works for traveling. Coffee could be hotter. Needs 2 pods at a time or coffee is too weak.